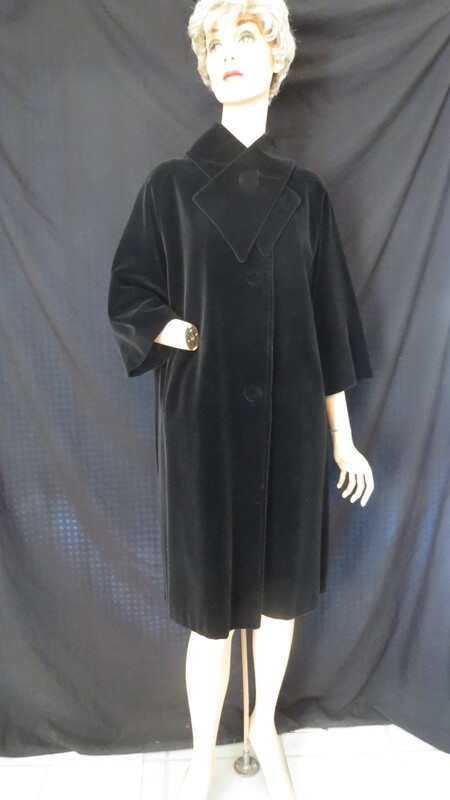 An early 1960’s velveteen “all-weather” coat that I would double as an evening coat! Love the covered buttons and the beautiful attached neck scarf, plus stylish 3/4 sleeves that look SO fabulous with longer gloves. I’ve found several of these (one in emerald green!). Made in Canada. Stella modeling the great nylon black and white checked coat from the 1950’s that I found in Australia. These utilitarian coats were popular in the ’40’s and ’50’s, but this is the most stylish example I’ve ever seen, with a print, rather than plain. 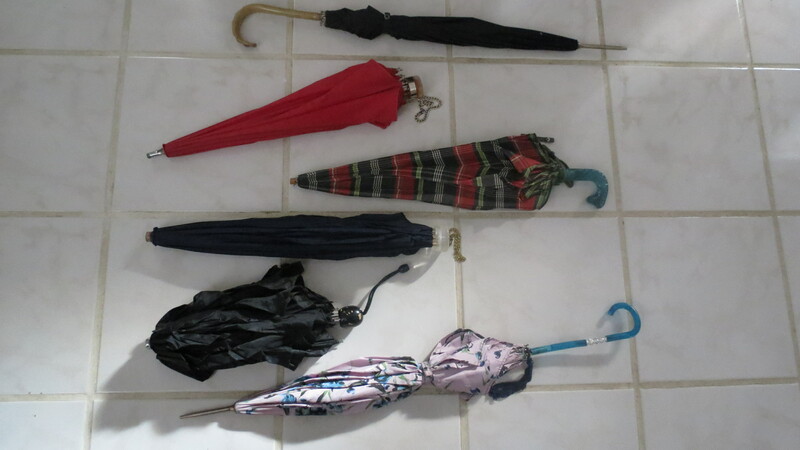 Finally, most of my umbrella collection. Some have great prints and some are most distinguished by the handles. Always a fun statement. Love the old Lucite and the vibrant colors! I may be able to use one today . 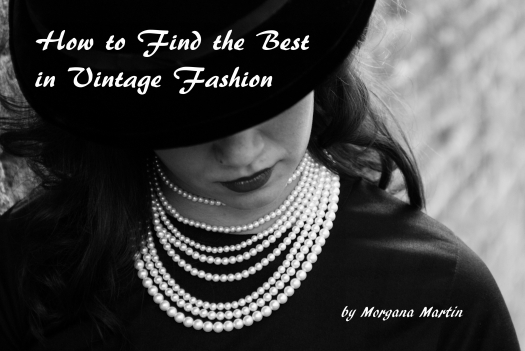 . . . .
Posted on October 14, 2017 by Morgana Martin, the magicvintagespy. 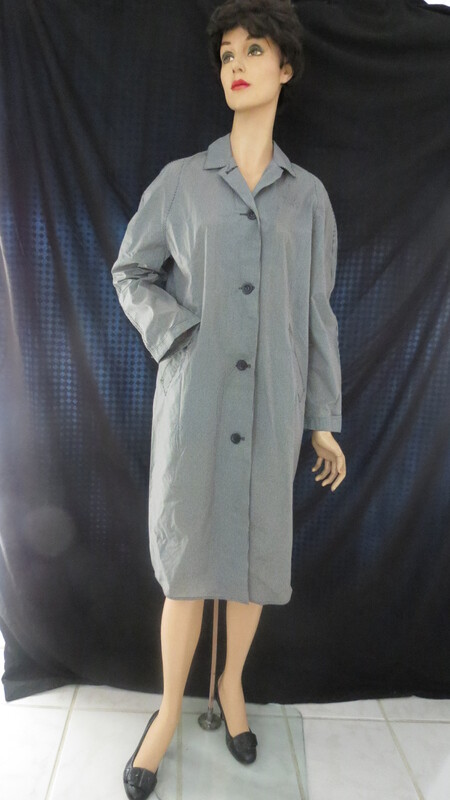 This entry was posted in clothing, fashion, find, ladies, Lucite, mid-century, raincoat, true vintage, umbrella, vintage, vintage blogger, vintage clothing, women's and tagged '40's, '50's, '50s, '60's, '60s, 1940's, 1940s, 1950's, 1950s, 1960's, 1960s, 40's, clothing, fashion, fifties, Fifties, find, forties, Forties, ladies, Lucite, mid-century, rain gear, rain-gear, raincoat, sixties, Sixties, Spring, spring, true vintage, umbrella, vintage, vintage blogger, vintage clothing, women's. Bookmark the permalink.